Stewart Hanshaw7,8,9,10 [Stewart Handshaw11,12, Stewart Henshaw13]. Born Feb 22 18371,3,10,13,14,15 [about 18362], Ohio1,3,10,13,14,15. Hanshaw, Stewart, age 33, born in Ohio; farmer; $1400 real estate; $465 personal property. Hanshaw, Rosanna, age 24, born in Indiana; keeping house. Hanshaw, Jesse Logan, age 4, born in Iowa. Hanshaw, Rosanna C., age 1, born in Iowa. Hanshaw, Eliza J., age 11, born in Iowa; attended school. Hanshaw, Stuart, age 44, born in Ohio; father born in Virginia; mother born in New York; farmer. Hanshaw, Rosann, wife, age 34, born in Iowa; father born in Kentucky; mother born in Ohio; keeping house. Hanshaw, Jessey L., son, age 14, born in Iowa; father born in Ohio; mother born in Indiana; works on farm; attended school. Hanshaw, Roseann C., daughter, age 11, born in Iowa; father born in Ohio; mother born in Indiana; attended school. Hanshaw, Ernest A., son, age 9, born in Iowa; father born in Ohio; mother born in Indiana; attended school. Hanshaw, Gracie E., daughter, age 7, born in Iowa; father born in Ohio; mother born in Indiana; attended school. Hanshaw, Laura L., daughter, age 4, born in Iowa; father born in Ohio; mother born in Indiana. Hanshaw, Mary F., daughter, age 1, born in Iowa; father born in Ohio; mother born in Indiana. Hanshaw, Stewart, age 47, born in Ohio. Hanshaw, Roseann, age 39, born in Indiana. Hanshaw, Jesse L., age 14, born in Van Buren County, Iowa. Hanshaw, Cora A., age 16, born in Van Buren County, Iowa. Hanshaw, Ernest A., age 13, born in Van Buren County, Iowa. Hanshaw, Evelena, age 11, born in Van Buren County, Iowa. Hanshaw, Laura L., age 8, born in Van Buren County, Iowa. Hanshaw, Mary A., age 6, born in Van Buren County, Iowa. Hanshaw, Berth, age 4, born in Van Buren County, Iowa. 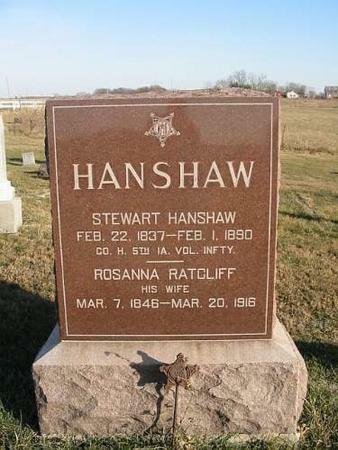 Hanshaw, Rosa [unclear], head-of-household, age 54, born Mar 1846 in Indiana; father born in Kentucky; mother born in Ohio; widow; occupation: farmer; owned farm (free). Hanshaw, Bertha, daughter, age 19, born Dec 1880 in Iowa; father born in Ohio; mother born in Indiana; single; attended school 8 months. Hanshaw, Earnest A., son, age 29, born Jan 1871 in Iowa; father born in Ohio; mother born in Indiana; married 9 years; occupation: farmer; rented farm. Hanshaw, Minnie A., daughter-in-law, age 32, born April 1868 in Iowa; father born in Ohio; mother born in Indiana; married 9 years; 2 children, 2 living. Hanshaw, Lester A., grandson, age 8, born Jan 1892 in Iowa; parents born in Iowa; attended school 7 months. Hanshaw, Agnes K., granddaughter, age 6, born Dec 1893 in Iowa; parents born in Iowa; attended school 6 months. Ferris, Mable, boarder, age 19, born May 1881 in Iowa; parents born in Iowa; single; occupation: school teacher. 1870 census, Lick Creek Township, Van Buren County, Iowa; page 293, line #22, dwelling #40, family #39. 1880 census, Lick Creek Township, Van Buren County, Iowa; roll T9-0367, ED 25, page 359D, line #23, dwelling #78, family #80. 1885 Iowa State census, Lick Creek Township, Van Buren County, Iowa; page 358, line #29, dwelling #170, family #180; http://www.ancestry.com. 1900 census, Lick Creek Township, Van Buren County, Iowa; roll T623-462, ED 99, page 2B, line #86, dwelling #40, family #40. U.S. Census, 1870, Lick Creek Township, Van Buren County, Iowa. Contribution from Lori Lei Knapp (). "Civil War Muster Rolls". Provo, UT: Ancestry.com. "American Civil War Research Database", http://www.ancestry.com. 1850 census, Smith Township, Belmont County, Ohio; page 268, dwelling #2291, family #2318. Contribution from Bertha Davis () citing: death certificate for Roseanna Ratcliff Hanshaw. Contribution from Bertha Davis () citing: Roseanna Hanshaw Civil War pension application. 1870 census, Chequest Township, Van Buren County, Iowa; page 217, line #9, dwelling #46, family #46. USGenWeb Archives, Iowa Gravestone Photo Project.